OHP III is a light installation that investigates the poetic potential of an obsolete technological medium, the overhead projector. The additional film rolls of the projector, usually manually operated, are moved and controlled through motors and sensors. Those augmentations control the behaviour of 20-meters-long hand-drawn transparent film foils, which roll and unroll back and forth with different speed and rhythm. The overhead projector thereby becomes an alternative filmic device. Analogue images, patterns or texts are mechanically moved and slowly mutate creating a choreography. Again and again they compose new stories and narrations through the aesthetics of the overhead projection. 16 - 18 October 2015 // GENERATE! 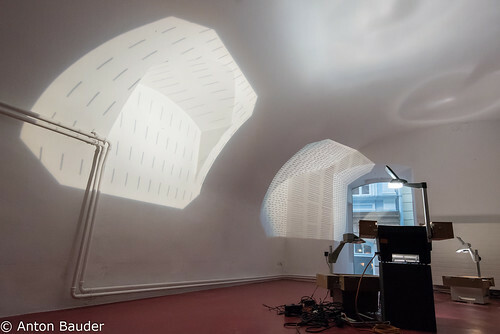 Festival f�r elektronische K�nste | Shedhalle T�bingen, Germany. 3 - 7 September 2015 // Ars Electronica Festival 2015, Linz, Austria. 1st May - 24 May 2015 // SchauRaumEck EckSchauRaum, Gmunden, Austria. 22nd October - 23 November 2014, Linz, Austria. GENERATE! Festival f�r elektronische K�nste | Shedhalle T�bingen, Germany. // 16 - 18 October 2015. Post Post, Interface Cultures at Ars Electronica Festival 2015, Linz, Austria // 3 - 7 September 2015. SchauRaumEck EckSchauRaum, Gmunden, Austria // 1st - 24th May 2015.